121/365 – “X/Y PROJECT” nr.1, a photo by Luca Rossini on Flickr. Welcome to the fifth monthly theme of the “365 Days of RX1: one camera, one lens, twelve projects”. As you may know, I am developing a 365 using solely the Sony RX1, and each and every month I focus on a different theme. This month will be dedicated to the birth of my first collaborative artistic project, X/Y PROJECT. The seed of the idea was planted in my head by the artist Maura Manfredi, and it eventually grew very fast and very strong. Faster and stronger than any other idea I worked on, I would say. Take this example, we’re just shooting the first pieces of the work, and we’ve already got accepted for a first exhibition at the Chiostro del Bramante (Friday 21st of June, 21.30), one of the finest artistic locations of Rome. Maura is an exceptional young artist, and by working intensively with her during these days I can already see this one project being just the first of a long series. We actually already worked on a common project months ago, that “American Buffalo – the photographic sequel” which has been recently awarded with the first prize at “Scene da una Fotografia” 2013. That said, what’s the X/Y PROJECT? Well, it isn’t really easy to define, maybe because its very definition is left somehow open to the interpretation of each of its participants. The original idea’s seed, the one Maura shared with me months ago, was to give a chance to anybody to be part of a work of art and, to do so, to make the latter modular and repeatable. 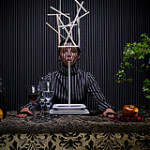 She had thought of an infinitely long dinner table for this purpose. Photographed from two perspectives, one frontal (like the one in this picture) and one from above (as you’ll see tomorrow). 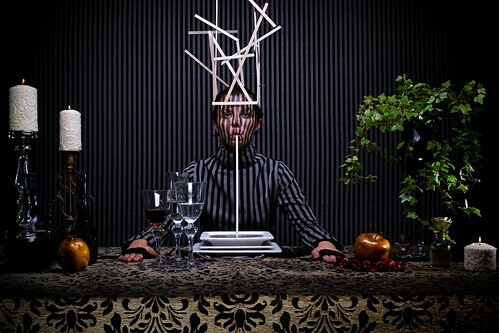 The two perspectives would introduce other dissimilarities, spatial and temporal, not only in the furniture and in the subject’s costume, but also in the frontal image depicting the “beginning” of the dinner, and the one from above showing the “end” of it. Such a scenario brought along so many dichotomous concepts, such as order-chaos, good-evil, life-death, apparent-hidden, truth-lie, and so many religious symbolisms, like the last supper, the human and the godly perspective, that it blew my mind off. So, again, what’s the X/Y PROJECT? It’s a visual research, from a symbolic and iconographic viewing point, of the innerly dichotomic nature of the human being, constantly hanging the balance in the precarious equilibrium between order and chaos, good and evil, life and death. And it is an open and collaborative research, meaning that each participant brings his or her own interpretation of this concept, meditating on his or her dichotomies as if they were the “soul’s cartesian axes” and from there picturing how his/her life and body would look like at the most dramatic extremes of such axes. This means that every shot comes with a true and personal story, deeply human in its very nature. These stories will be collected, together with the shots, in this blog for the next thirty days, but also in the blog dedicated to the project. Because X/Y PROJECT won’t end after the exhibition at the Chiostro del Bramante, nor will it after the end of this monthly theme, but it will go on as long as there will be participants willing to share their view on the concept and to be pictured in it, becoming part of an open, collaborative, and potentially extremely alive work of art. You’re all invited, of course! Let’s talk about the shot. She’s Maura Manfredi. If she’s the mother of X/Y PROJECT, then I’m the eternal lover. I decided to start with her so you could meet her. She wanted to visually reflect her connection with the work, and so she literally “wore it”. Then, in the frontal, ordered view of the Y plane, she felt about picturing her inability to materially produce her highest ideas. Those ideas remain in her head, or over it, but her hands are incapable of performing any meaningful action, and she finds herself relegated in a cage. Her grey, monochromatic, intellectually creative, cage.